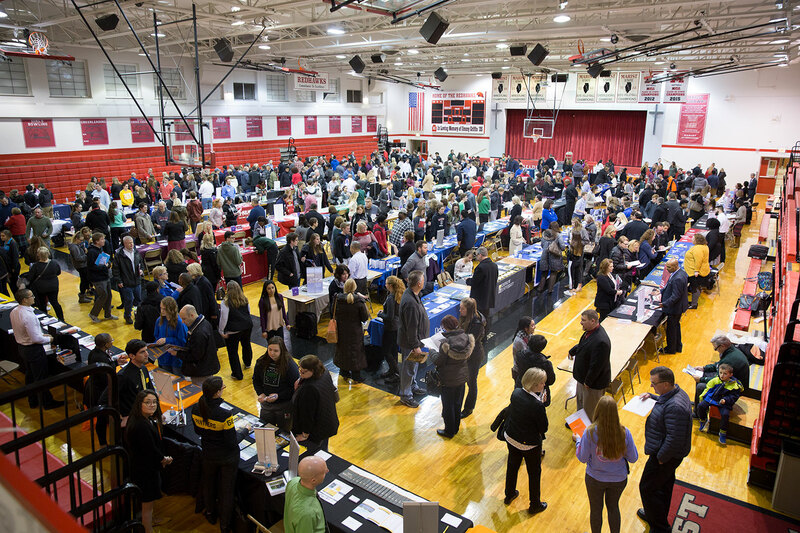 StriveScan was at Marist High School in Chicago’s Mount Greenwood neighborhood last week. The counselors at Marist did a great job of preparing their student for the fair by having every junior register for a barcode during class. I usually speak to a good number of students at the Marist High School fair each year, but walk away with an average of 2-5 contact cards filled out. With StriveScan this year, I was able to talk to the same number of students but walked away with information from 24 students. Not only that, scanning has allowed us to get “cleaner,” legible data from more students immediately and have more meaningful connections with each family. StriveScan is also piloting a project to offer standalone scanning devices. University of Illinois at Urbana–Champaign was able to scan their first student at the Marist Fair, using one of StriveScan’s scanners. April Ponte, Coordinator of School Relations (right), with the first student scanned by the University of Illinois at Urbana-Champaign. The student joked he would put the achievement in his application essay. More information about the new scanner program will be announced soon! Thank you to all of the counselors at Marist, including College Counselors Nicki Peterson and Kim Meyers, for a very successful fair!